Twenty one years ago this week, on Saturday, July 1, 1989, the grunge band Nirvana played The Axiom in Houston, Texas. Were you there? This was well before Nirvana rose to national prominence with 1991's Nevermind, the album credited with taking punk mainstream. 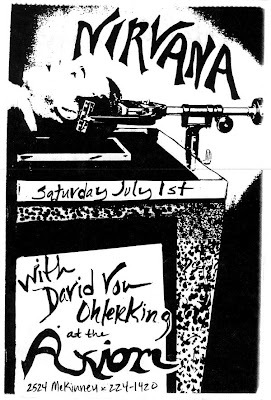 David Von Ohlerking - a staple of the Houston music scene - was also on the bill. Nirvana would return to Houston, of course. Their last gig took place on Monday, December 6, 1993 during the In Utero tour - just five months before lead singer Kurt Cobain would take his own life. Living in Houston at that time, I skipped that show, thinking that surely the band would return to Houston again on a non-school night. It was, of course, not to be.